This is the first of two reports on wind turbines and aesthetic design. The second is The Landscape Impact and Visual Design of Windfarms by Caroline Stanton. There is also a discussion of aesthetics in chapter eight of Wind Energy Comes of Age, in the Preface to Wind Turbines & the Landscape, and in Design as if People Matter: Aesthetic Guidelines for the Wind Industry. Wind Turbines & the Landscape originally appeared as Vindmøller og Landskab: Arkitektur og Æstetik in late 1995. The English translation, which wind energy aficionados eagerly awaited, was published in late 1996. The report is beautifully illustrated with color photographs and land use maps depicting various views of wind turbine installations across Denmark. These installations include single turbines, clusters, and wind power plants. Technical specifications for each photo include the size, type, and number of turbines, their spacing, and the point of view from which the photo was taken. The maps, in scales of 1:40,000 and 1:25,000, offer sufficient detail to identify roads, railroads, power lines, buildings, water courses, drainage canals, urban and industrial areas, and forests. Combined with Denmark's 1:100,000 Topografisk Atlas, the detailed site maps can be used to replicate the views found in Wind Turbines & the Landscape. Wasting no time, Nielsen clearly states his theme in the first paragraph: "Ecological awareness combined with artistic insight are to be considered key concepts when technical installations, including wind turbines, are located in the landscape." "The goal," he goes on to say, "is to establish a beautiful and narrative composition in relation to water or land surfaces, a visual balance between elements in the landscape created by man and nature, (as) a whole. Nielsen warns early in the report that every effort to 'hide' or 'blur' a wind farm seems to be doomed to failure from the start because wind turbines exceed the scale of nearly all other objects on the landscape. But wind turbines can be successfully integrated with the land. Single wind turbines used by farmers, for example, become functionally a part of the farm and its other farm structures. "Order is the first commandment of aesthetics," says Nielsen. In the design of wind plants this commandment emphasizes the necessity of presenting the wind turbines as "a clear coherent unit, i.e. in geometrical--often linear--formations" that contrast with the landscape. "A wind farm can be regarded as a gigantic sculptural element in the landscape, a land-art project if you like. . . The purpose must thus be to make the wind turbines and the landscape form a coherent unit emphasising both elements. . . . It is essential that the delimitation of the wind farm is perceived in a clear, unambiguous way--both at close range and from a distance. . . . This is best achieved by . . . creating rhythm and order in the internal geometry. And with a significant distance to other turbines in the area." 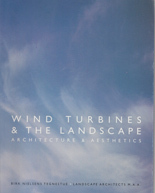 The latter theme of visually separating one project from another was emphasized in a 1984 study by architecture students at California Polytechnic Institute in Pomona, by landscape planner Robert Thayer in the late 1980s, and again more recently by Scottish landscape architect Caroline Stanton in her report, Landscape Impact and Visual Design of Windfarms. When wind turbines are erected in a geometrical pattern, Nielsen stresses that the individual turbines should be "located in accordance with an overall, thorough-going system to make it easier to perceive the wind turbines as a coherent cluster and not as single, scattered turbines. "Coherency" and "clarity" of a wind power plant as a single visual unit is a theme that is constantly repeated by both Nielsen and Stanton. As with CalPoly's findings in 1984 and that of subsequent observers, Nielsen recommends that designers strive for uniformity "with respect to design, rotational direction and speed, colour, height, and rotor diameter" among the turbines in their arrays. Advocates of dispersed or distributed generation in North America who are struggling to define just exactly what these terms mean will find Nielsen's suggestions helpful. He describes a wind plant as "a cohesive group, consisting of 8 or more single turbines," a definition sufficiently broad to encompass the small arrays envisioned in America's heartland. For his part Nielsen defines a "cluster" as an array of 4-7 turbines. Clusters require special design consideration. Because there is less interference among turbines, Nielsen suggests packing the turbines closer together in clusters than would be acceptable in larger arrays. From a distance, tight clusters are perceived as a compact installation. In the example at Klinkby, four Vestas V27 turbines were installed in a row four rotor diameters apart. Nielsen explains that one of Denmark's first wind plants was installed on the island of Fanø in 1983. The project totaled 13 turbines. After the turbines were installed, roads used during construction were covered over and revegetated. This is of special interest considering the current controversy in California with erosion from wind plants due to excessive road construction. In a related example, page 15 offers a striking photo of a wind turbine installed in the border between two fields. The land is tilled to the base of the tower and there are no roads servicing the turbine. The book examines 33 sites in some detail. At Kappel, for example, Nielsen suggests that the design of the DWT Wind Dane 34 "lacks clarity, and the nacelle appears architecturally unconnected with the otherwise very curved components of the wind turbine." Other less charitable observers have called this particularly wind turbine a "box on a stick." Nevertheless, Nielsen finds the sweeping arc made by the array alongside a coastal dike is quite pleasing in its repetition. Like others in the Danish wind community Nielsen argues that proper proportioning of components is essential for a coherent wind turbine design. "There should be a harmonious relationship between the tower and nacelle, between the nacelle and blades, and between the blades and tower--with aerodynamics as the common basis for the design," he says. Similarly, he joins Thayer and Stanton in suggesting that the transition between the vertical lines of the tower and the horizontal lines of the ground is a critical area as well. "Unfortunately, turbine arrangements are also often marred by ugly transformer boxes in various shapes erected near the foot of the turbine. It would seem a good idea in the future to integrate this function in either the base or at the bottom of the turbine tower." Nielsen summarizes by encouraging designers to strive for total solutions: "from the overall landscape perspective, the transition from the turbine to the terrain, to the design of the turbine itself." The inclusion of scenes of wind turbines on the Whitewater Wash in the San Gorgonio Pass has almost become a cliche among observers of wind turbine aesthetics. Nielsen's caption to the obligatory photo of a phalanx of machines on the Wash notes that the "dense compact turbine arrangements appear as technical landscapes with a scary but also fascinating effect." Nielson concludes that wind power development is here to stay and that development will only intensify. (This observation is not quite so apparent from the North American side of the Atlantic.) Wind turbines, he says, when located thoughtfully, can enrich the cultural landscape rather than detract from it. Wind Turbines & the Landscape is a must for all wind turbine and wind power plant designers. It should also be required reading for every chief executive officer of a wind company, especially those in California. Wind Turbines & the Landscape: Architecture & Aesthetics by Frode Birk Nielsen, Birk Nielsens Tegnestue, prepared for the Danish Energy Agency's Development Programme for Renewable Energy, 1996, ISBN 87-985801-1-6, 63 pages, A4 format paperback, can be ordered for DKK 225 ($40) excluding VAT from Birk Nielsens Tegnestue, Soendergade 1A; DK-8000 Arhus C; Denmark; phone: +45 86 20 21 10; fax: +45 86 20 26 76. Originally appeared as Vindmøller og Landskab: Arkitektur og Æstetik, ISBN 87-985-801-0-8.